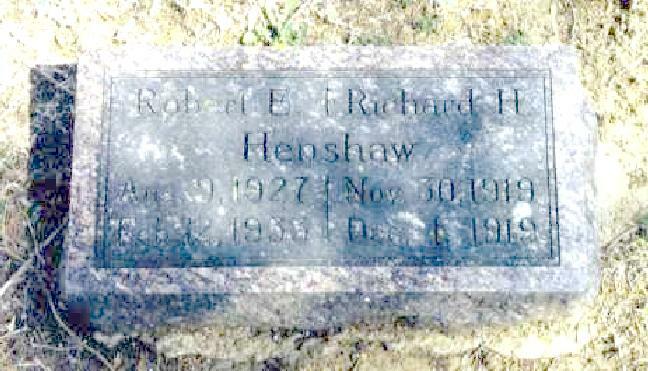 Henshaw, Richard H., head-of-household, age 26, born in Kansas; parents born in Missouri; rented home; occupation: agent, insurance co.
Henshaw, Cora M., wife, age 21, born in Kansas; father born in Kentucky; mother born in Iowa. Henshaw, Audrey, daughter, age 1, born in Kansas; parents born in Kansas. Henshaw, Richard, head-of-household, age 37, born in Kansas; parents born in Missouri; first married at age 25; owned home ($1300 value); radio in home; occupation: freight clerk, railroad depot; not a veteran. Henshaw, Cora, wife, age 31, born in Kansas; father born in Illinois; mother born in Iowa; first married at age 18. Henshaw, Audrey, daughter, age 11, born in Kansas; parents born in Kansas; attended school. Henshaw, Virginia L., daughter, age 5, born in Kansas; parents born in Kansas; attended school. Henshaw, Robert, son, age 2 years 8 months, born in Kansas; parents born in Kansas. 1920 census, Winfield, Cowley County, Kansas; roll T625-528, ED 78, page 4B, line #76, dwelling #83, family #88. 1930 census, 5th Ward, Winfield, Cowley County, Kansas; roll T626-698, ED 45, page 8A-B, line #50, dwelling #186, family #200. Obituary of Audrey E. (Henshaw) McCollum. Obituary of Carol S. Henshaw. 1900 census, Rock Creek Township, Butler County, Kansas; roll T623-472, ED 4, page 3A, line #38, dwelling #51, family #51. 1910 census, Rock Creek Township, Cowley County, Kansas; roll T624-436, ED 54, page 35B, line #51, dwelling #30, family #30.